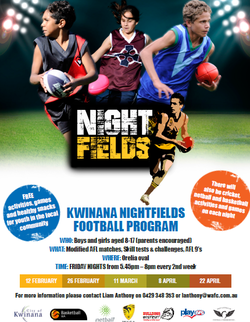 Another successful Nightfields program was held last week in Kwinana at Orelia Oval, the night saw over 120 kids participate in a variety of sports including Football, Netball, Cricket and Basketball. Each participant enjoys a healthy dinner when they register each night, along with a social, engaging and fun environment. The third session is held this Friday 11th March, 5.45pm – 8pm.